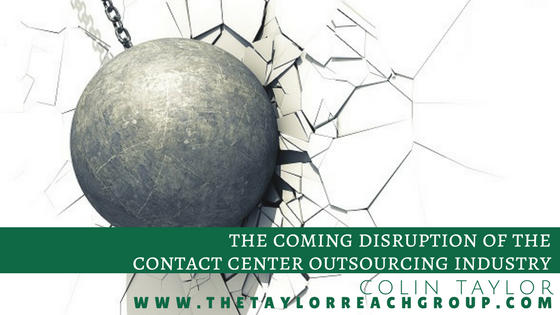 The Coming Disruption of the Contact Center Outsourcing Industry – Part 2 | The Taylor Reach Group Inc. The old Contact Center Outsourcing (CCO) model is broken. As outlined in Part 1 of this series the traditional approach to contact center outsourcing has resulted in a quantitative focus on metrics like Service Level, Abandon rate, and AHT, rather than a qualitative focus, inflexibility to meet client demands, Quality Assurance that doesn’t assure anyone of quality and Risk/Reward models that only benefit the CCO. Clearly, this is not a recipe for customer success and is a contributing factor to why it is so difficult to deliver superior service in an outsourced environment. So, what do we need to do to create the environment where customer success is possible and where the CCO can deliver truly superior service? First, we need to understand that what got us here (quantitative metrics, locked forecasts, echo chamber quality assurance and the illusion of Risk/Reward), will not take to where we want to go. That isn’t to suggest that we should throw away all of these elements. No, in fact, we need to keep a number of the qualitative activities as they do in fact underpin required practices such as WFM and WFO. But these quantitative building blocks are just table-stakes and should be presumed to be something the CCO can do and be successful at doing. These elements for retention would include the basic elements of the forecasting process, the need to for a quality function, and the ability to create a safe place to trial new ideas and approaches that can replace the negatively focused Risk/Reward. The tired old CCO approaches to these activities won’t cut it today and we need to reimagine how these activities can function in a collaborative environment where both the CCO and client are laser focused on achieving the best outcomes and experiences for their customers. Let’s examine how a shift to the qualitative can help achieve ‘best outcomes and experiences’. Today many CCO internal quality programs are generic, the form for Client A might be 90% the same as for Client B. To truly be effective a quality program needs to measure the quality of the interaction, from the customer perspective. Too often quality evaluations are perceived to be ‘mini-performance reviews’ and focus too much on catching someone doing something bad rather than on helping them to do better. Internal quality at best is our own perception of what is important to the customer, regardless of whether it actually is important. This point and the futility or calibrating a 5 to 6 on a 10-point scale are why most quality programs actually offer no insight into actual quality. A better approach is to look at the quality process as two sides of the coin. On the one side, you will have internal ‘compliance’ measures. This is an internal checklist of those activities that agents should or must do (or not or never do) on each and every call. These are black and white, yes no questions…”did we use the approved greeting”. There are no shades of grey, no ambiguity, just a binary yes or no. 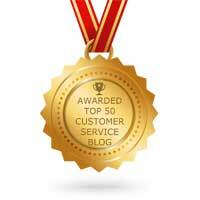 The second side of that coin is the direct customer feedback related to the specific interaction in question. This is typically an email survey that asks 4-6 regarding the interaction, professionalism, ownership, resolution, NPS and ’top box’ are the usual themes. Together this makes for an effective quality program, without expensive and time-consuming calibration and ambiguous results. Of course, a process is required to operationalize this approach to ensure that the ‘compliance’ calls are assessed once we have received the customer feedback, managing blackout lists etc. All we have successfully built at this point is a better quality program, we haven’t changed the CCO operational model, until the quality of the agent, team, center, and LOB become contractual metrics. The customer feedback survey data allows us to add other contractual metrics such as FCR, VoC, CSAT, NPS etc. We know intuitively that better hiring, better training, and better coaching will produce better performing agents, but most CCO’s don’t want to make that investment or take that risk. And why would they? Why take that risk when clients are willing to accept a ‘bums in seats’ driven service level, AHT or abandon report, where the quality of the interaction is unknown. The problem here is not with the CCO’s it is with clients who have been willing to accept mediocre performance and sub-par service quality. If we define the contractual metrics as qualitative rather than quantitative we will get results that align with our interaction quality objectives. We will see more care and dollars invested in hiring the right people, providing the right training and coach in the right way to achieve the quality performance goals we are seeking. Forecasting and scheduling will still be required, but in a quality-centric world, the adverse effects of long wait times and access issues will be factored into the staffing plan to support the quality goal. Service Level attainment becomes a by-product of the qualitative approach rather than a goal unto itself. How quickly will we see this disruptive change? Well, it won’t be overnight, but we are inextricably marching toward this goal. The power to drive this disruption lies with the client and with their refusal to subject their customers to a service model that is designed to deliver a mediocre result.